iRhythms A303 review | What Hi-Fi? iRhythms has been busy of late setting up its stall in the vast iPod accessory market, but it's going to have to do better than the A303 if it's going to thrive in this competitive market. Incidentally, the A303 and A302 differ only in colour, with this model being black. Built for versatility, the A303 can be used both in the home and as a set of travel speakers. 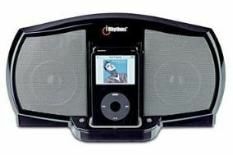 iPods fit snugly into the universal dock well – which, as you'd expect, also charges your player – and the remote control offers basic interaction with your iPod. There's a minimum of connectivity: all the A303 really has to offer is an auxiliary input. This does enable the dock to be used with other MP3 players and portables though, which further boosts its travel credentials. Sonically, the A302 doesn't really justify its price. The bass gets a little lost at times, even though the midrange holds up adequately, and detail retrieval is fairly good. This iRhythms doesn't really have the power for home use, so at best is an okay travel companion. Having said that, something like Logitech's Pure-Fi Anywhere is a far better iPod speaker dock to pack on your hols.